Earlier this week Bora Zivkovic (@boraz) blogs editor at Scientific American tossed out the following links on twitter, and asked for thoughts. Both links were to articles from the Nieman Journalism Lab, the first Want to produce hirable grads, journalism schools? Teach them to code and the second News orgs want journalists who are great a a few things, rather than good at many present two different ways of thinking about the skills journalists need to have. The links started a conversation on twitter (excerpted below) between Bora, Rose Eveleth (@roseveleth) Kathleen Raven (@sci2mrow) Lena Groeger (@lenagroeger) and myself (@erinpodolak) I felt like there was more to say on the topic, so I decided to take it to the blog so that I could respond to everyone's points without the confines of twitter brevity. I definitely agree with this point from Rose, there are so many different skills you use as a journalist but a lot of what you need to know will vary based on your personal style and interests, what platform you write for, and what topics you are covering. I've found that I learned a lot more from going out and actually chasing down stories than I did sitting in classrooms. Of course, the guidance of journalism school makes learning by trial and error much less perilous than it can otherwise be, so classroom lessons have value too. I moaned an awful lot about how scary being turned loose into the unemployed masses at the end of grad school seemed. Journalism has adapted to changes in viewership, platform and the poor economy, and so too must journalists or we run the risk of ceasing to be relevant. Making yourself as employable as possible is a good thing, but only if you are going after jobs where you can really contribute. You'll only be able to contribute if either you know what you are doing or you have the desire and the drive to learn what to do. This thought brings me to the next point I made, not all the skills journalists use will appeal to all journalists. As a profession we can do a lot of different things, but that doesn't mean that everyone wants to do everything. If you are looking for a job, you have to be honest with yourself and your resume. I think for young journalists there is a temptation to trumpet skills that we only sorta, kinda, maybe have from that two hour seminar we sat through that one time. You can fit what I know about code on the head of a pin, and I've sat through basic training courses multiple times. My resume says nothing about being able to code, because I honestly don't know how. It is always better to be honest about what you know. If you aren't an expert in something, don't claim to be. All you'll do is disappoint possible employers. I think you can go a lot farther being honest about where you are with your skills, if you don't know code but would like to then say so. If you've edited a video once or twice and would like to continue developing those skills then say so. Just don't make yourself into an expert in something when you aren't. I recently graduated from the professional track Master's program at the University of Wisconsin-Madison, a program that with only three core courses is left purposely open for students to do their own exploring. So what exploring did I do? I chose to spend my time taking science classes (mostly zoology) learning more about narrative writing and structure, and getting a better handle on social media, personal branding and marketing myself online. All good things to learn while at school, but I didn't learn code. I honestly have zero interest in code, it isn't something I've ever wanted to do, I don't have the patience for it and I feel like my brain just doesn't absorb even the basic information about code whenever it is presented to me. But that doesn't make me an inept science writer. Kathleen Raven joined the conversation, and brought up the following reason why not knowing code can still be okay. Part of the reason I think I haven't been particularly motivated to learn code is because I haven't needed it. I was able to set up this blog and my website (www.erinpodolak.com) on Wordpress using basic templates that suited my needs. I'm on Twitter, Facebook, LinkedIn and G+ but none of these online activities involve needing to write my own code. To do what I want to online I haven't run into the need to write code. Kathleen then made another point about a science journalism skill, the ability to do math, which can be overlooked but is important to a writer's skill set. You need to do something that you enjoy. If you don't enjoy code then in my opinion you shouldn't feel like it is an essential skill to have. You might want to be the kind of journalist that can do it all, kudos to you for that. But, I don't think there is anything wrong with wanting to have a few select skills and being really good at them. If you are honest with yourself and honest with employers I think you can definitely learn an array of skills that suit you and your job. We have options, and that is a great thing. Happy times, indeed. Note: This is only a brief excerpt from the first few days of this conversation. Much more was said, including more back and forth between Lena, Rose and myself about skills and how to present yourself to employers and from Bora, Lena, Rose and Dan Fagin (@danfagin) about the structure of jschool programs and the balance needed to meet students needs. Still plenty more to say about these topics! This conversation took place before we started the hashtag #sci4hels to mark all of the tweets. Be sure to monitor the hashtag in the future to see more of the on going discussion between Kathleen, Lena, Rose, Bora, myself and others! Thank you so much, that's kind of you. 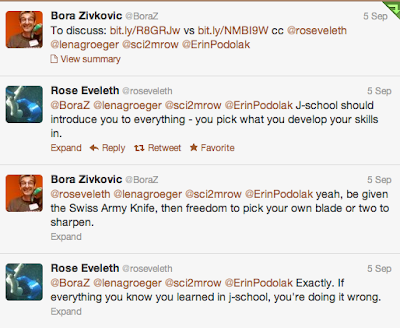 I obviously had help - Bora, Rose, Lena, and Kathleen all made great points and got me thinking!